Revenue responsibility: are you owning it? Chances are, when you started your role in B2B marketing, you weren’t tasked with revenue generation. After all, delivering the company’s income has traditionally been the responsibility of sales with marketing more often offering up-stream support. Take a look at the sales team in your own organisation. They spend weeks on end developing business opportunities, making contact with leads, forecasting revenue pipeline, juggling buying committees, and closing deals. It takes persistence, time and not a little luck to hit their quotas. So what happens when less and less of the sales process is actually under their control? What happens when senior management decides that marketing should be more directly responsible for revenue? In most B2B companies today, sales still carries significant quotas, but marketing is becoming responsible for an ever-increasing amount of revenue. 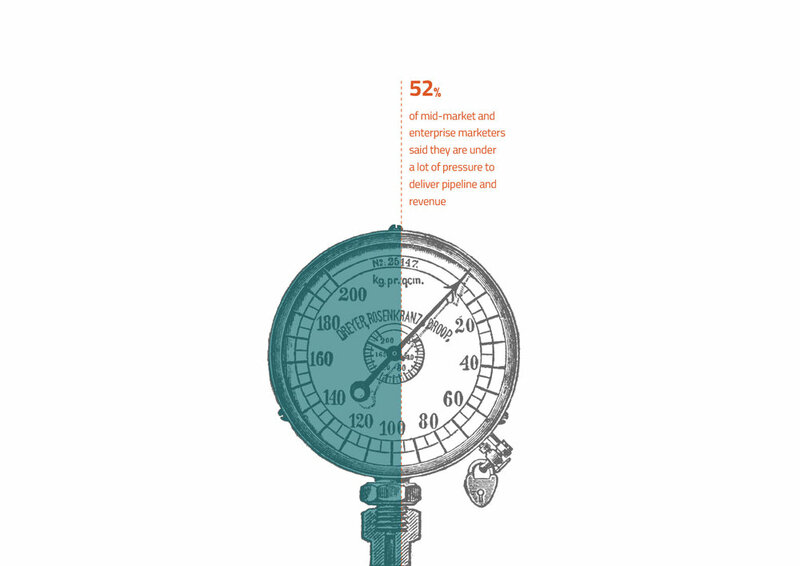 In our latest research, 52% of mid-market and enterprise marketers said they are under ‘a lot of pressure’ to deliver pipeline and revenue. This increases to 56% when we look just at enterprise marketers. A massive 86% of respondents say the pressure has become worse in the last 12 to 18 months. Just under half (49%) say it’s increased a lot. Of course, advances in campaign analytics and marketing attribution have made rapid improvements. Today, more than ever, marketing can see the direct results of its activities all the way to bottom-line revenue. It’s imperfect certainly, often showing more correlation than causation, but it’s leagues ahead of where it was just a few years ago. What’s more, the modern B2B buyer is showing an increasing tendency to avoid sales until they really have to. They’re doing more online research and content consumption, becoming more informed before making contact. In fact, LinkedIn found that the average decision maker reads 10 pieces of content before completing their purchase decision. Simply, they’re spending more time as an ‘unknown’ – more time on marketing’s side of the fence. While the pressure is on, to be clear, this isn’t bad news. After all, it wasn’t too long ago that marketing was under constant pressure simply to prove the value of its existence. Having responsibility for the bottom line is a dramatic improvement in comparison. It demonstrates that companies recognise marketers as not merely the brand’s purveyors of creativity, but contributors to the business and its growth in a meaningful way. But it does mean a greater emphasis on accountability – and that means delivering hard numbers. In fact, in our research, 31% of respondents say increasing marketing-driven revenue is a key marketing priority for the year ahead. It also means implementing brand and demand strategies that can handle a greater part of the sales cycle, as the marketing department is also handing off opportunities at later stages than before. And it means having a far better relationship with sales. Ultimately, it means marketers can no longer collect email addresses and pass them to sales as ‘leads’. They need to take a more rigorous approach, tracking prospects across the entire lead-to-revenue cycle, assessing and scoring them against meaningful metrics at every stage. The move to more bottom-line responsibility means fluffy lead metrics are out (as are vanity measures of engagement such as likes and shares). So what replaces them? The number one performance metric for the marketers in our survey is delivering marketing-generated pipeline/revenue – even ahead of closed:won rates. This is both a reflection to the increased pressure they face and a demonstration of a move to adopting a more commercially-focused mindset. The reality is that, today, marketers have access to a wider range of data than ever before, and can respond it far more nimbly as well. As such they can gain greater intelligence and insight into buyers and trends than ever before (far more than is generally available to sales). What’s more, marketing is a function that understands the wider market. The CMO is predominantly a market-facing role. It’s their job to be able to understand and respond to changes in customer expectations and demand. The results from our study are clear: it’s time for marketers to take responsibility for more of the pipeline, and ownership of the revenue targets. How many new customers will it take to meet it? What’s the typical ratio of sales qualified leads to get to that number of clients? And how many marketing qualified leads need to convert? This will also mean balancing your short- and long-term objectives. The danger of developing a revenue obsession is that longer term brand building gets ignored. However, significant research shows that without investment in your core brand, long-term revenue growth will stall (see How Brands Grow by Byron Sharp and The Long and the Short of It from the IPA). On one hand, it means focusing on lead generation and revenue acceleration over the near term (the next two or three quarters). This may mean building what’s starting to be called a Revenue Operations (RevenueOps) capability that’s custom tuned to moving prospects through the sales cycle and converting more of them at each stage. But it also means continuing to build a distinctive, relevant brand that will deliver a revenue multiplier over the longer term. It is still the case that buyers tend to select from a surprisingly small number of potential vendors. These will be drawn from those that they are somewhat familiar with (and will be the ones they tend to research as a trusted source of information). The reality is, you need to be on their radar before they begin the purchase process. And that means growing your brand. The new revenue reality comes with a higher level of pressure and responsibility for sure. But it offers rewards, as well. According to Gartner, marketing leaders that own or share P&L responsibilities command 20% larger budgets. That could go a long way towards making the purchasing process better for sales and buyers – and getting marketing closer to its revenue target. And ultimately, it will allow marketing to fully take its place at the top table of business decision making. Download your copy of the Revenue Rift Report and get the full picture on what other marketers just like you are doing to meet the challenge of delivering for the bottom line. Got questions? Contact us at hello@consideredcontent.com, we’d love to help.